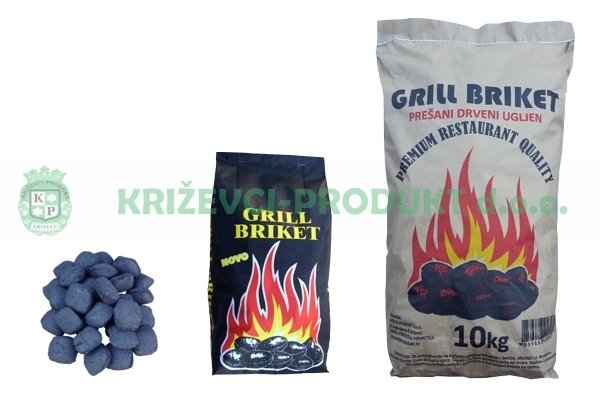 ﻿ Charcoal briquettes | KRIŽEVCI-PRODUKT d.o.o. Wood charcoal briquettes for barbecue is made by pressing small reprints of wood charcoal. Its quality is that it burns slow, keeps the flame going for a long period of time and it is made from our quality wood charcoal. It develops extremely high temperature by combustion. It is used for easy food preparation for our families and friends. This product is developed for quick and easy use in a way that meets the expectations of every hobby user. Charcoal briquettes are produced by pressing charcoal, without using chemicals. This product is primarily intended for professional users for open-fire grilling. This product is of the same quality as the PREMIUM RESTAURANT QUALITY charcoal briquettes, but refined for use in grill ovens (Josper, Kopa and similar charcoal grill ovens). Instant Light Charcoal briquettes are the simplest and safest way to barbecue. Individually packed for convenience they are ideal for beginners or for a last minute impromptu barbecue. High quality Charcoal briquettes is covered with high quality wax and individually packed in 1,4 kg bags, all you have to do is light the bag. The product is completely safe and meets the European standard EN 1860-2, EN 1860-3.